The first destination was Bajedha Khurd village in western Uttar Pradesh's Hapur district, nearly two hours from Delhi. The first report was on a lynching in Hapur, in Uttar Pradesh. On June 18, when a 45-year-old Qasim Qureshi, a meat trader, was lynched by a mob, while 65-year-old Samiuddin, a farmer, was badly injured. NDTV travelled to Bajedha Khurd village to meet one of the accused, Rakesh Sisodia, who is out on bail. Sisodia went on: "Maine turant kaha, 302 aur 307, full murder and half murder, wo gaaye kaat rahe thee maine usko kaat diya baat khatam (I said section 302 and 307, full and half murder, they slaughtered cows, I kill them)." Guy is out on bail ready to kill more. Secular India exposed again. Wonderful operation. Why is the news channel not doing an expose on cow smuggling, it proves it is biased. Mr. Jinnah we can never thank you enough. What would we have done had you chosen to stay in England and not come back. If he had stayed in England then muslims in india wouldn't be a minority and these vigilantes would not have dared to target them. Any tweets from Mohammed Kaif? This is only one guy out of almost one billion, I have never heard majority of Indian protesting by these extremists rather I have seen people on this forum defending by saying it happen once in a while. Total Muslims in South Asia, around 200mil in Pak, 150 mil in India and 150 mil in Bangladesh. That is about 500 mil Muslims compared to approximately 1 billion Hindus. In fact had Pakistan not been created (which also lead to creation of Bangladesh) the Muslims would have been a larger minority and hence there would have been even greater friction and maar dhaar between Hindus and Muslims. For this reason we can never thank Muhammad Ali Jinnah enough. it's ironic how Muslims of Hindustan overplay the patriotic card yet the cow vigilance will keep bringing them back to their lone condition of Muslim. Jinnah already saw that the cosmetic secularism of Gandhi/Congress will fade away to show its true Saffron colors (leading British intellectual Perry Anderson says the same in "The Indian ideology"), and the Modi-fied BJP is just accelerating the dynamics. You just can't aggregate these two spiritual systems in one place, iconoclastic Islam and its pure monotheism with pagan Hinduism and its casteist purism (see how Dalits are treated, what do you expect for other "outsiders"). And the fact that foreign-descent Khan's are the best known "celebrities" in India doesn't change all of that. Such a cowardly statement. Q-e-A will be embarrassed he fought for such people. 14 percent muslims are holding their own against hindus, imagine what 500 million would have done. Good post. Logical rather than utopian. There was always going to be friction between Pagan majority and monotheistic minority. Such friction would be seen less in a monotheistic majority and a pagan minority because pagan minority can adjust better than monotheists given that pagans can worship both one God or million gods. The monotheists dont have this luxury. The nature of state has to be secular though. Once again I am cursing myself as I find myself agreeing with you. This fearful mentality seems at odds with the history of Islamic Ummah where division of Muslim populations would be considered counter-productive. There was no division of muslim population when idea of Pakistan was propounded. ALL Muslims had the choice to join Pakistan. Divisions were created later. It sounds good in theory, but reality was much different. Before partition there was no Kashmir problem, no Bangladesh problem etc. Practically speaking, dividing land according to religion was always going to create further problems and that is how it has panned out. The only development has been that those who left are more confident in their identity, and those left behind are weirdos who have to change their faith to suit majority religion through lesser numbers hence less influence. True. The partition was not just of british india, but of the muslim community as well. So much that when muslims in india are oppressed, there are people who gloat about it and join the thank you Q-e-A chorus. Sure the cow is holy to some but dont these extremists who are ready to kill realise human life is always more valuable than some animal? You have to be a right idiot to believe otherwise. Many Indian's I know admit that Quaid Jinnah was absolutely correct of how Muslim's in India will eventually be second class citizens. Why does India not stop exporting beef if they love cow's so much? Not only Muslim's but million's of people from other faiths including Hindu's consume beef as well yet these bigots only target their Muslim's it seems. For those who are saying Indian Muslim's are fighting the bigots well what choice do they have? There would have been such problems even if the subcontinent had not been divided, don't disrespect the creation of Pakistan or take it for granted. For those who love Indian Muslim's so much feel free to move to India if they will have you. Now you see how the situation in India is. This is not the India that was earlier any more. true. human life is more valuable than an animal, that is why God Almighty Bhagwan likes Qurbani/bali, the more valuable qurbani, the more pleased he is with his children. Killing in the name of worshipping anything is a sign of mental degeneration. Especially more so when the object of worship is as unimpressive as a cow. At least with those that worship a mystical sky figure, you can give them credit for a vivid imagination. The children are the ones pleased not God because they get to eat the animal. What evidence is there in the Hindu scriptures regarding the cow being holy? What needs spinning? Criminals saying that they will kill again for religion? In your own opinion who started the problem ? Hindus or Muslims ? Simple clear unambiguous one word answer please. Something wrong with your guys comprehension? He clearly asked for one word unambiguous answer. I have met plenty of Hindus who have no issue with anyone consuming beef or in transporting a cow, maybe it has to do with living in US or Canada, they had to leave their ignorance behind to assimilate? only Radicalized extremists Hindus would find an excuse to kill Muslims of India. So I had to emphasized. You could have done that in a more inventive way and still stuck to the parameters like I did, by changing the font to orange thus denoting extremist Hindus. Hindoos who can't let peoples peacefully have a nice beefsteak. So essentially trampling on other communities religious beliefs is not a crime at all. Got it ! Its quite stunning how even the most educated Muslims think that there is no problem at all in harming cows despite knowing very well that it is considered sacred. And then you have the gall to lecture others on topics like tolerance , assimilation , religious harmony and stuff like that ? Where are you getting all that from? Your friend wanted a clear, unambiguous one word answer and I gave one, don't start putting words in my mouth. Why is considered a sacred animal? Can you please quote some scripture? I see no difference between a cow and a goat apart from the size. And who is talking about the penalty and whether it was appropriate ? All I wanted to know was what lead to the murders from your perspective. So from yours and other posters response it is clear that you guys don't see any problem in the actions of the Muslims involved in this incident. Hence my previous comment. I just extracted them from your own mouth. Should muslim be killed for transporting cows on a vehicle by a muslim? or transport should be only handed by Hindu? YES or NO answer? Muslims consider shirk (polytheism/associationism) the biggest sin. Yet different Islamic dynasties, incl. the Mughals, let you remain pagans when they were submitting and controlling all these numerous Hindoos. They never enforced monotheism (tawhid) upon the Hindoos. So you should let Muslims have a nice beefsteak and not enforce compulsory diet. You seem to extract lots of thing out of thin air to further you extremists views on other. Last edited by Cricket-Pundit; 12th August 2018 at 00:19. Please provide the quotes. if that is indeed true, should be no problem for you. Before I answer this - Are you going to try the "never-heard-never-knew-about-cows-being-sacred-in-India" excuse ? It's a question like u asked above, unambiguous answer pleaae? Similarly, he takes recourse to Valmiki’s Ramayana to tell us of the dietary tradition of the gods and goddesses. “Rama was born after his father Dasarath performed a big sacrifice involving the slaughter of a large number of animals declared edible by the Dharmasastras. Sita, assures the Yamuna, while crossing it that she would worship the river with a thousand cows and a hundred jars of wine when Rama accomplishes his vow. Her fondness for deer meat drives her husband crazy enough to kill Maricha, a deer in disguise. Bharadvaja welcomes Rama by slaughtering a fatted calf in his honour,” Jha writes in the conclusion of the book where he also clearly tells us that whether it was the Age of the Mauryan Empire, including the period of Asoka or the Gupta Age, animal sacrifice as also eating of their flesh was very much prevalent. For instance, ceremonial welcome of guests was considered complete only with honey, curd and flesh of cow or bull. Even the “sacred thread ceremony for its part was not all that sacred; for it was necessary for a snataka to wear an upper garment of cowhide” and the deadtoo were sent away with animals. “The thick fat of the cow was used to cover the corpse and a bull was burnt along with it to enable the departed to ride in the nether world,” the illustrious historian writes. Even the arrival of Buddhism and Jainism did not put a full stop to the practice. After all, Buddha is said to have died after consuming a meal made of pork. Also Manu provided a list of creatures whose flesh was considered edible. In the list he exempted camel from being killed but not the cow. In fact, animal sacrifice, including that of cattle continued till modern times. As Jha has written, “As late as the 18th Century Ghanasyama, a minister for a Tanjore ruler, states that the killing of cow in honour of a guest was the ancient rule.” Even Vivekananda is said to have consumed meat in the U.S. I thought it was the British who gave independence to both India and Pak. Most of the article is about consuming animal meat, which is noise and irrelevant. Only two instances mention eating cow meat. Please provide original references for those. 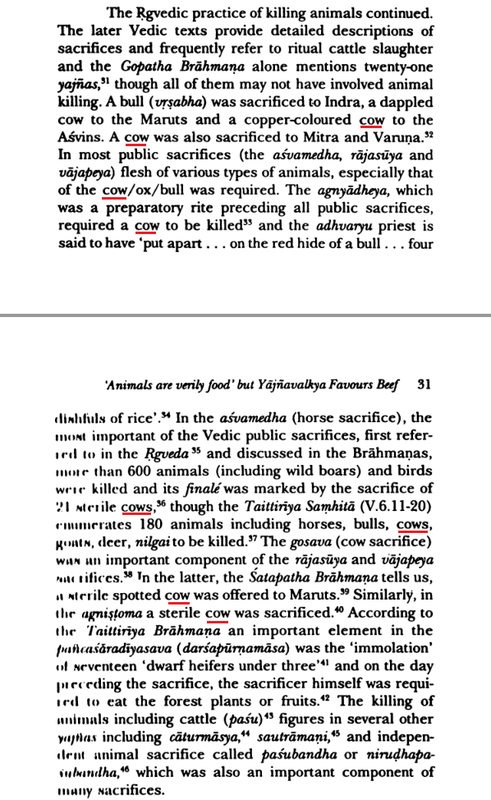 The view that the practice of killing of cattle as sacrifices and eating its flesh prevailed among the Indo-Aryans was, however, put forth most convincingly/forcefully by Rajendra Lal Mitra in an article, which was first published in the Journal of the Asiatic Society of Bengal, and subsequently formed a chapter in his book entitled ‘The Indo-Aryans in 1891’. Later in the early 40s, PV Kane – in his monumental work, ‘History of Dharmashastra’ – referred to specific Vedic and later Shastric passages that spoke of cow slaughter and beef eating. It is necessary to bear in mind that none of the above scholars had anything to do with Marxism, which the saffronised journalists and publicists like Arun Shourie have been fighting through the columns of the Asian Age. Wilson was the first occupant of the Chair of Sanskrit at Oxford in 1832 and was not as avowedly anti-Indian as many other imperialist scholars. Mitra, a product of the Bengal renaissance and a close associate of Rabindranath’s elder brother Jyotindranath Tagore, made significant contribution to India’s intellectual life, and was described by Max Mueller as the best living Indologist of his time. Kane was a conservative Marathi brahmin and the only Sanskritist to be honoured with the title of ‘Bharat Ratna’. Anyway, the very fact of cattle (incl. cow) sacrifice would be already too much for modern normative Hinduism, which is also a betrayal of the spiritual system the Aryans so generously offered to them. If you want to bash Muslims for having a nice beefsteak you guys should do the same with the Aryans/Hindu gods. So you don't have reference to present and it was a lazy copy paste job. We are followers of Lord Krishna and Lord Ram, both of whom were cow protectors. If you really want to pick some DN Jha (without having access to the real work and relying on blogs) you should show how the primary dieties were in favour of beef consumption, not what some random person who has no importance in scriptures or is valued by masses might have said. Also very poor logic of conflating the past with the present. Just because someone indulged in immoral unethical and blasphemous acts in the past gives no excuse for others in the present to do it. I think you're the one being lazy to not look into the evidences these authors (outside Jha) present. The point is that cattle (incl. cow) sacrifice is attested in the holy scriptures of the Aryans, and killing a cow for modern Hindus - who supposedly follow the ways of the Aryans, "immoral" and "unethical" as per you) - is itself blasphemous. We're not even talking of beef consumption here, actually, but the sanctity of the "gau mata", for whom man like in OP are ready to go on a killing spree. You are the one who presented a wall of text as evidence, so you are the one who has to present the references. Most of the rubbish you presented had to do with animal meat consumption. You have failed to show reference for the ones which talked about cow killing. Go on, don't be lazy. Are you having a slow day? We are followers of Lord Ram and Lord Krishna. Dare you to present anywhere where they advocated cow beef consumption. If you talk about scriptures, then have the courage to present it. Don't try to hide behind DN Jha. Show us what you have got. Does Prophet Ibrahim killing his son mean that Islam/Christianity advocates filicide? That would be a dumb take on it, which is what you are doing. You're being purposefully disingenuous. I quoted a respected Indian academic, Jha, who himself bases his book (not article or blog, but book), on many references, incl. Hindu authors and primary/secondary sources pertaining to Vedism/Hinduism. The rationale move to take would be to look into a book, not ask me to present you the evidences (spoiler : I'm not Jha the writer). You can be a follow of Lord Ram or Modi, it's tangential, the point is that the authors, themselves quoting your own holy scriptures, show that cow sacrifice happened in the texts respected by modern Hindus ; yet modern Hindus like OP want to slaughters those who slaughter cows, which would thus logically imply all the respect religious figures quoted by the said intellectual authorities would be their prime targets as well. Prophet Ibrahim (s) didn't kill his son, that's the whole point, and it's as commemoration of this story that we sacrifice an animal on Eid ul Adha, preferably a cow. Exactly, you are not Jha the writer, so unless you have evidences to show, don't try to ride the coattails of others when your only contribution is superficial copy paste. You say the authors show that cow sacrifice happened, which is purposefully disingenuous, because you fail to show that they showed it. Unless you can show it, save this pretence of knowing what you are talking about. The fact that we follow Lord Ram (thanks for insulting my religion by equating him with Modi, but as a Hindu I will only pray that you come to the Right Path), is not tangential, but THE main point. Unless you prove that our primary Deities encouraged cow meat consumption, everything else is tangential. 1. The references which your new favourite writers have to show scriptures approved cow slaughter. 2. Our primary Gods, who are followed by majority (like Sunnis among Muslims) encouraged cow slaughter. Anything else is tangential (not even academic unless you show references). Although let me categorically state that no one should be killed for beef consumption BUT cow slaughter is wrong and blasphemous. In fact, animal sacrifice, including that of cattle continued till modern times. As Jha has written, “As late as the 18th Century Ghanasyama, a minister for a Tanjore ruler, states that the killing of cow in honour of a guest was the ancient rule.” Even Vivekananda is said to have consumed meat in the U.S.
You can twist and spin it the way you want, but gau mata was being slaughtered in Vedic times and the man in OP would have threatened Aryan gods. bold text does not equate to reference. Show the reference these text are based on. You can copy paste all you want, use cute smileys and bold and italicise text all you want , but your superficial knowledge will keep getting exposed. Simple answer is it does not matter which Holy Text Does or Does not consider Cows as Holy. The thing that matters most is the law. According to the Law harming cows is illegal in India and I can assure you that this is common knowledge in India. So now lets go back to your original question where you were lamenting why BJP supporters were missing on this thread. The relevant question now is why do Muslims - even the educated ones as proven by some of the despicable comments here and other threads - do not have any respect for law of the land and the religious beliefs of non-muslims in general and idol-worshipers in particular. What is the source of this intolerance ? Once you identify and rectify this source then such incidents will automatically get resolved. Jha is an historian and an academic at the Delhi University. You really think that he would not give references while quoting stuff ? The ancient Aryans had no problem slaughtering gau mata, so the modern Hindoos who apparently respect their scriptures shouldn't either, whereas Muslims will keep having a nice beefsteak. Again you are not showing the references. Superscript numbers is not equal to references. Thanks for the effort, but you need to try bit more, then we will discuss those original text. You cannot hide being the fallacy of appeal to authority. Anyway I posted what I had to, it's up to the peoples if they either want to trust a well respected academic who's a prolific historian or an e-***** cow vigilante. @KingKhanWC all of that responds to your question as well, about the sanctity of gau mata in the scriptures. I have seen your well respected academics, like that audrey truschke. Whose whole argument falls apart if you start investigating the references. As expected you run cold feet when asked to show the ground truth, from which these academics are supposed to have drawn their inferences from. I dare you to debate based on the ground truth. You need to do a logic 101 to understand appeal to authority is not a valid argument. Isn't Hinduism ever evolving anyway? Even if at one point eating beef was approved in ancient texts, it could well be that that custom was discarded in some subsequent evolution of the faith. The flexibility of Hinduism is often cited by followers as one of it's biggest strengths - and also weaknesses as they have been too flexible in letting Islam take root in the subcontinent. Let the psuedo historian first prove it. I am armed with text from Rig Veda and Bhagwad Gita, two most important scriptures. He is yet to show the text from even the tangential scriptures. Isn't it also possible that the Rig Veda and Baghavat Gita have also become less relevant as Hinduism evolved? In much the same way Manu Smitri was also considered inappropriate beyond the era when it was relevant? So what became more relevant in their place, that must be answered first. We hindus are humanists first, if we find that a part of scripture does not stand the test of time, we ignore it. Although such scriptures are often from tertiary text, not the primary scripture we draw our faith and morality from. Cow protection is a humanitarian act. Eating the flesh of the animal you drank milk from? There is a reason Islam gives importance to milk, and if two people consume milk from same person, they are considered siblings. Also, eating less meat is sunnah, The Prophet (PBUH) ate meat rarely, but muslims have strayed and built a reputation that meat is synonymous with muslim food. I think Muslims, not only those who live with Hindus, must give up meat, not just beef, so that they become better muslims. Your own Hindoo academics, quoting your very own revealed scriptures (shruti), say that there were animal (incl. cow) sacrifices in the times of Aryans. You are supposed to follow the ways of the Aryans. If you have an issue don't talk to me but directly to Jha or try to contact Agni, who was particularly fond of cow meat. You can also deny the authority of the Vedas and become nastika like the Jain's/Buddhist's, who are the first to have criticized the animal sacrifices. Vrisha-Kapi was the son of one Parshu a female of the tribe or class of Manu. His father’s name is not mentioned. Indra had many slaves, and Vrisha-Kapi seems to have been in command of them. Whether Vrisha-Kapi himself was originally a slave is not quite clear. He seems to have been once sent to chastise some enemies, when, with his following of slaves, he rebelled against the authority of Indra. Even after this rebellious conduct, Indra continued to be as kind to him as before. This kindness was doubtless owing to the superior quality of beer and beef supplied by Vrisha-Kapi at the table of Indra. The hymn undoubtedly belongs to a time when beef was an article of daily consumption, both Indra and Vrisha-Kapi being very great beef-eaters. The author of the hymn also, even supposing for a moment that he was not a beef-eater, could certainly not be counted among those who held beef unclean. Now, if you do or don't, it's not of our concern, but the prophet (s) not always eating meat doesn't mean that those who do will be bullied/killed. In fact, in an Islamic state the dhimmis are allowed to eat their pork, and in the same way we will keep eating gau mata. Again, all tangential literature, nothing from the main Rig Veda or Bhagwat Gita. Especially Bhagwad Gita supersedes everything, just like The Prophet (PBUH) is the seal of prophets. All your desperation in proving that cow protection is not a central tenet in Hinduism is ignorance, which will not be washed away by copying links and bolding text. Eating meat rarely is a sunnah. It is only greed and gluttony which has led muslims astray and probably explains why the muslim world finds itself in its current state. Also the bad karma caused by killing cows. I've been asking this question for years on this forum but no Indian Hindu poster has responded. So the cow can be sacrificed meaning it's not holy in the way India's laws believe it to be. Who steals the milch-cow's milk away, O Agni,-tear off the heads of such with fiery fury"
Goto Page 907 and read point 16. Last edited by Tusker; 13th August 2018 at 06:09. Thanks for the links, but now I am very keen to get a copy of the Rig Veda and the Bhagavat Gita. Are these available in book form like the Quran so one may study them? While some may not appreciate the pasting and the bolding, I think we need to give more credit for the studious nature of his efforts which surely take time and trouble to compile and cross-reference. Sterling work my friend. Muzaffarnagar | Two Muslim youths were allegedly thrashed and paraded by a mob led by the head of a vigilante group on suspicion of smuggling two cows in Uttar Pradesh’s Shamli district this evening, police said. The head of the cow vigilante group was arrested and the two youth were booked under the UP Prevention of Cow Slaughter Act, and taken into custody, they said. Superintendent of Police Shlok Kumar said Dilshad and Shah Rukh were ferrying two cows, which they claimed were bought from a temple priest to their village when the mob intercepted the truck in Shamli town and attacked them. Anuj Bansal, the head of the cow vigilante group, has been arrested and a search is on for the other members of the group, he told PTI. According to the FIR, the duo and the priest, who was also in the vehicle, told the attackers that they had bought the cows for rearing, but the accused thrashed the two youths and paraded them in the area. The priest was not attacked, police said. On receiving information about the incident, police rushed to the spot and rescued the youths. They have been have been taken into custody, police said. Not sure why muslims continue to eat beef in India despite knowing how sacred cows are considered in Hinduism. If muslims have a problem with people in other countries drawing caricatures, then why not stop disrespecting other religions? Can't have it both ways. Conversely it could be said that the Hindus are disrespecting the muslims of India by not allowing them to eat beef. Also you said other countries but this concerns the same country. Last edited by Kroll; 22nd August 2018 at 01:46. How so? There is a reason why the country is named Hindustan. They can choose to make as extreme hindu laws as they wish just like Pakistan has its own religious laws. If people want, I could write down a whole list of personal freedoms which are banned in Pakistan solely due to Islam yet cause no one any harm. If Pakistan can have such laws and regulations, then why can't India?